An easy sweet dish which all will love. Soak Sooji in 2 cups of water for 1 hour. In a Kadai, put the Ghee and when it is melted properly, add the sugar. Mix well. When the sugar turns brown, add the soaked Sooji little by little and mix well. When the Sooji and the sugar gets mixed properly, add the cashew nuts and raisins. When the mixture starts separating from the sides, remove it to a dish to set. After 20 minutes, cut the halwa and serve. Thanks nishita and rashmi. u can check more of my tested and proven recipes in nimmyskitchen.blogspot.com. hope u will like them. hi nimmi...your recipe is awesome....I made it and everyone at home liked it.....even my friends were amazed to know that suji need not be roasted and it turned out to be vedry tasty as well.......thank u ....u made my day......keep posting such good recipes. Thanks. wow! this one is so easy to make..i'm definitely going to try. Hi Naina, Thx for your comment. 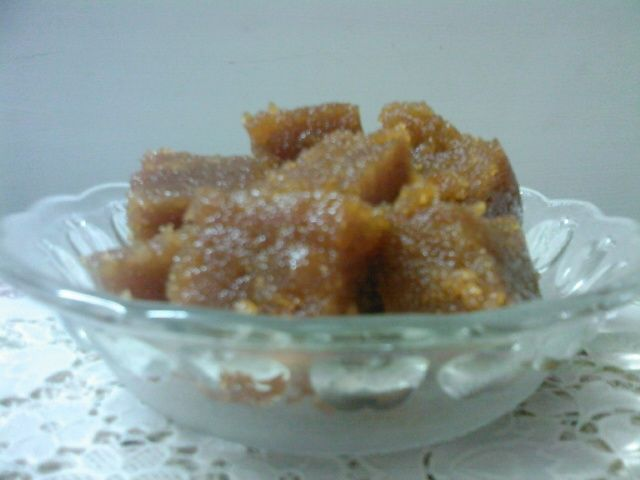 Melted jaggery can be used instead of sugar. But you wont get the caramel taste if jaggery is used. Hi sonu, thx for ur comment. No need to roast the suji, u can directly soak it so that it will become very soft. can we roast the suji before soaking? nice recipe but it can be more deliciouse if add coconut powder and caramel milk on it.